Book cover for "Cosmik Debris"
Greg Russo, Crossfire Publications. First edition August 1998; revised first edition November 1999. 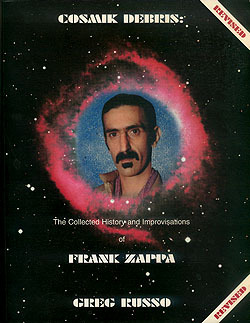 This is an authorized reprint of Greg Russo's articles titled "The Collected History and Improvisations of Frank Zappa" in the February 1993, May and June 1994 issues of Discoveries Magazine. "Frank Zappa is the most prolific composer and recording artist of the 20th Century. Besides his guitar mastery, Zappa's ability of incorporating any style into his unique body of work is unprecedented. Even before his death in 1993, Frank Zappa attained success and respect in the rock and classical worlds. In recent years, an increasing number of classical ensembles have included Zappa's music on programs including other great masters, such as Mozart and Rossini. Greg Russo, author of books on The Yardbirds and Manfred Mann, compiled this book from his series of Discoveries Magazine articles. Now updated with amazing information published for the first time, 'Cosmic Debris' provides readers with the first fully accurate and comprehensive overview of Frank Zappa's career and output. Read the Look Magazine article that encouraged Frank Zappa to discover the music of Edgard Varèse and see the first LPs he bought. find out about Frank's early 60's Studio Z recordings and the infamous raid on his studio. Discover the humble beginnings of The Mothers Of Invention and their notorious rise to prominence as kings of the underground. Armed with 'conceptual continuity' clues, a gig list and a massive discography, 'Cosmik Debris' gives Frank Zappa fans an inside view of his career that no other book has ever attempted." This page was last modified on 10 May 2011, at 15:01.